It's a spritz-on lightweight moisturisation with lustrous Community Trade organic olive oil. Its very rare for me to like oil mist sprays. I mean, seriously, with our tropical weather.. do I really need to be more oily? Haha. That was my first thoughts when I heard about The Body Shop's Olive Oil Dry Mist. Normally when you hear oil mist sprays, especially here in the Philippines, its not really a first option for one to buy. But then I heard from several people, one being JEN (shopgirljen.blogspot.com), who swears by it and has used this product even several years ago. So I got curious. What's the big deal about Olive Oil anyway? Yeah I know, you are probably wondering why a type of cooking ingredient is used for body "beautification". Plus wouldn't you end up smelling weird? Yep, those questions did swirl in my mind. I checked it out on the net and apparently Olive Oil is indeed an awesome moisturizer because it contains linoleic acid, a compound not made by the body, but which prevents water from evaporating. But reading about that doesn't really exactly show the effectiveness of Olive Oil as a Dry Oil Body Mist.So I had to "experience" it to be a believer in it! Its a good thing that I was able to get my hands on it thanks to one of The Body Shop events (which you can read in this post) because honestly I wasn't that motivated enough to pay around Php 700 plus on a small bottle of oil. So when I finally got my own Body Shop's Olive Oil Dry Oil Mist - I instantly fell in LOVE with it and swear by it! So here are my thoughts on this product. 1. SMELL. Oh boy was I sooo wrong in my assumption that this olive oil would smell weird and funky. 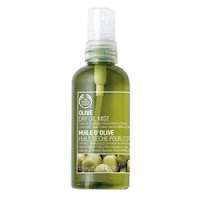 The Body Shop's Olive Oil Dry Oil Mist smells AWESOME. It has a light smell that does have a faint olive oil scent that we all know BUT reworked into a refreshing scent. The scent is NOT overpowering. But it hooks you I swear! 100% of the people who has smelled this product on me swear that it smells sooo good and immediately ask what it is. Everyone gets surprised when they find out that it is Olive Oil. So yeah the scent is definitely a winner! 2. MOISTURIZER EFFECT. It is definitely what it says it is. It is LIGHTWEIGHT. The oil absorbs quickly! Plus it leaves your skin smooth and soft. For me, this worked soooo much better than all the lotions I have put on myself. One of my friends have noted that I do sometimes have rough dry skin. Especially my hands. But when I put it on, my hands are immediately soft and not dry and rough. It is NOT sticky. It doesn't make you feel oily (dry oil nga eh..). And the best time to put this on your body is immediately after you shower. 1. PRICE. Like I said earlier, I wasn't too thrilled to pay Php 795 (srp) for a bottle of olive oil. But after experiencing the product, I tell you IT IS WORTH IT. It is my absolutely favorite body moisturizer. I use it more than my lotion. I have also been using mine for 3-4 months na and so far I still have more or less half of the 100 ml bottle left. If you still think its a bit expensive, you can check out The Body Shop counters during SALE season. I know they mark it down as low as 30% off. This bottle was sold during a sale period at P495. Not bad na diba? 2. PACKAGING. Well more specifically, it is a spritz. I guess for me, I want to make every single drop of the product count. So I really dislike spritzing it on my legs or arms coz some of the product doesn't land on me (sayang! hehe). To compromise, I spritz the product on my hand. Only then do I spread and rub it on myself. That's a Tipid Tip right there! 1. SHAVE. It can be used as a safe and natural lubricant for a close shave. 2. EXFOLIATE. Especially for your face and hands - rub olive oil on your skin then scrub with sugar or coarse salt, then rinse. 3. SKIN SOFTENER & ANTI AGING MOISTURIZER. For soft and youthful hands, smooth generously on your hands before bed then wear cotton gloves. i Love THE BODY SHOP's OLIVE OIL DRY OIL MIST! So Coffeeholics! Have you tried out this product already? Or do you already have one? Or maybe you can recommend YOUR favorite body lotion or moisturizer? Don't forget to share share share!